Hi everyone! Sometimes, one small image is more than enough for a card. For this card, I wanted to make something that only uses one image but at the same time make the card look "full". Watercolour is a big hype for a while now and I am a big fan. I hope you like this card! To share with everyone that just one image can help to make a card look "full". Sometimes, I'll be on a budget and I try not to buy everything that comes out because I can't afford to keep buying everything. So, this is when I'll take the time make full use of my stamps and doing something like this can give a stamp a different look. I wanted to have a freehand watercolouring look and for this I always use the Antique Linen Distress Ink because it's one of the lightest ink I have. Distress Ink works well with water so you won't see any obvious ink lines anymore. 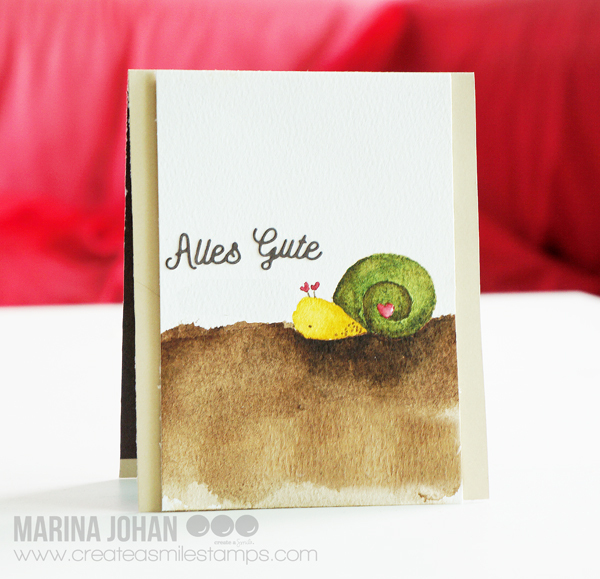 I used a Daler Rowney paint set for this watercoloured card. Instead of just painting the shell or face with one colour and few shades of the same colour, I added some brown to the green. This gives more texture to the shell and it doesn't look so "flat". And I really like how it turned out. The beauty of watercolouring is that you can achieve this look easier than if you use copics/pencils.